These are big times for Time. The newsweekly will release a special issue on the death of Osama bin Laden that will hit newsstands Thursday, May 5. It’ll be the third issue that Time will have released in the past week and the first time it’s published three issues in the span of a week. (The other two are the Royal Wedding edition that hit Monday and the regularly scheduled issue that went on sale Friday). 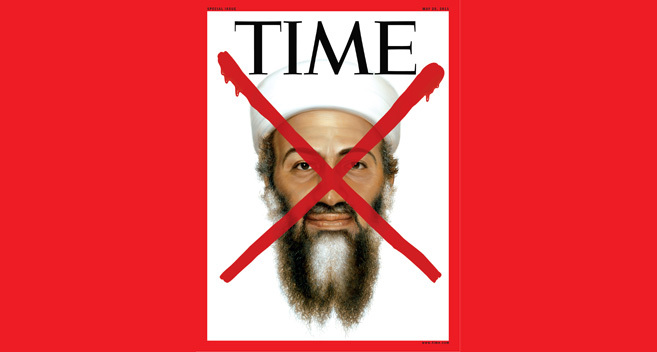 The bin Laden cover, which shows the face of the dead terrorist leader covered by a red "X," is the fourth to use the red “X,” which Time has reserved for some of history’s worst: following Adolf Hitler in 1945, Saddam Hussein and Abu Musab al-Zarqawi also got the treatment. The 68-page special issue will be sold at the regular cover price of $4.99 and will be available on the iPad the same day. Newsweek is also doing a special issue on the subject, which should hit newsstands Friday.